Photo courtesy of Shari Watson. Sign above a switchable electrical outlet in Nadi Int’l Airport, Fiji. I’m stuck, what should I do. What task do you require of me Aiumi? You will be severely tossed off. OK Aiumi I will be your slave for a week. Not only will you be taken to task, but you will be the house-slave of our S & M Mistress for a week. Gimme the crazy glue; I don’t want to be taken to task. Looks like a country of scofflaws. There’s not a single person adhering to that sign. Mind you, there’s not a lot of space. I assume you mean Task, South Dakota, a place I would never go back to. Not even a 7-11 or a Taco Bell. Sheeeesh! Yo, yo yo! Adhere to THIS, MOFO! It adheres to the sign or it gets the, uhhhh, what was it again? The toes, the nose, the rose? Sorry, can’t remember. So I said to the lady at the ticket counter “Excuse me, I think someone’s offed your switch. Do you think maybe you and me can get it on?” That’s when she started hitting me with the courtesy phone, officer. “What task?” you might be wondering. Why, the task of turning the switch back on, of course. The sign can’t adhere to the wall. “Off with his switch!” — Queen of Tasks. Oh no! Not to task! anything thing but task! Got to suspect that, when the sign was put up, something was plugged into that outlet. (All that switch would do is turn the outlet off). In Task the task tasks you. As far as adhering goes. YOU CAN STICK YOUR SIGN! Beware of cling-ons Mr. Spock. What if it’s already off? That’s a real nice sign you got there. Be a real shame if something were to happen to it. Actually, except for the missing verb, the English is good … I just never before had a sign threaten me with a stern reprimand. This is for the main power grid at Nadi airport. 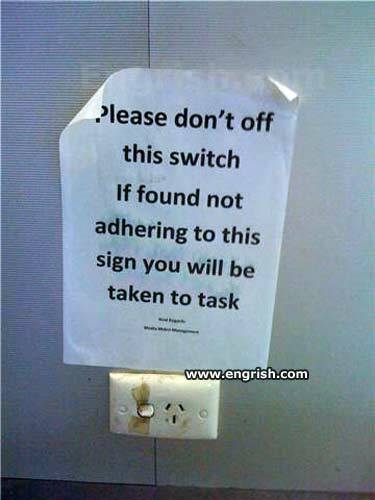 Trust me, I thought it was funny too- so i offed the switch and didn’t adhere myself to the sign. They didn’t care as much about the dead switch as much as not gluing myself to the damned sign. The task was to eat a 55 gallon drum of figi pudding for the holidays. it wasn’t pretty. BE WARNED. think about it.